Apple Certified Lightning Cable-My co-workers are always forgetting or losing their phone charger so this is perfect! Adult Coloring Books and Pencils -Of course I have to include some kind of creative gift and this adult coloring book bundle is perfect. Brings out the kid in all of us! NFL Plush Throw-This blanket is great for the Football fan and I know several who will be getting this! Men’s Flannel Pajama Bottoms (2pk)-Nothing beats flannel pajama pants on a cold Winter’s night, or a Sunday watching football! This is a 2-pack people! Ultra Plush Pet Bed-You can’t forget your furry friend this Christmas! Look at how stylish and comfy this pet bed is. Cozy Plaid Blanket Scarves-These blanket scarves are all the rage and these colors are beautiful! Winter Nights Flannel Sheet Set-There are several sheet sets under $25 but for those cold winter nights, you can’t beat flannel! Stainless Steel Water Bottle-These stainless steel water bottles are great for co-workers, College kids, really just about anyone and you can get a 2pk for a buy one, keep one if you want. Monogrammed Custom Leather Journal-My Son is a writer and goes through Journals like toothpaste. These leather bound journals are so cool and have a rustic feel that so many people love. What is your must have gift from Groupon? 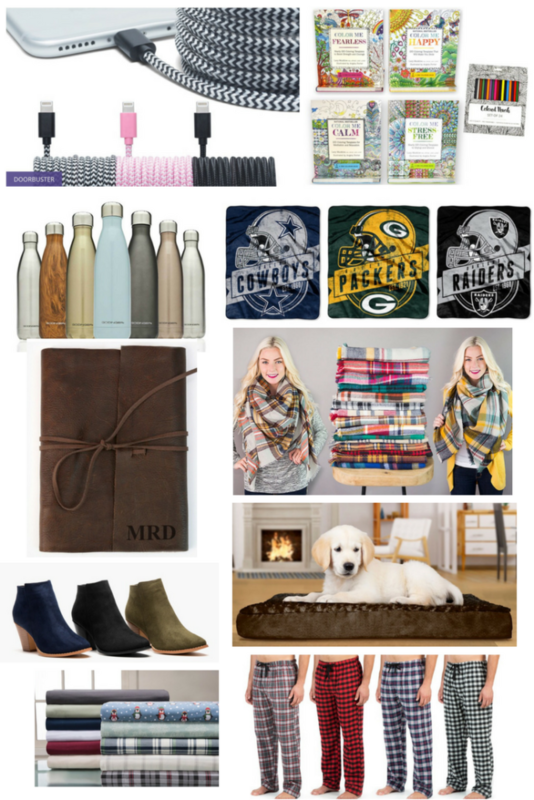 I hope you enjoyed this Holiday Gift Guide. Be sure to check out my Holiday Gift Guide NewAir Wine Cooler Giveaway and enter for a chance to win your own wine cooler! Thank you for visiting Our Crafty Mom. Have a great day! Groupon is awesome! I have a stainless steel water bottle and I love it! yes x 1 million to plaid scarves! Love those plaid blanket scarves! I would never have thought of Groupon for gifts, but that’s a great idea! I would never have thought of groupon for gifts. Great ideas!